Los Angeles Rams general manager Les Snead will have his hands full attempting to find, and fill team needs with players in the 2018 NFL Draft. While the direction of their draft has largely been predicated on a list of needs created following mini-camp rather than by just selecting the best player available in year’s past, the Rams’ needs may be far and few between this offseason after their aggressive start to 2018. With eight picks all within 108 selections of one another from Rounds 3-6, the Rams may become likely trade contenders in this year’s draft as they’ve addressed arguably their biggest need already this offseason with the acquisition of cornerbacks Marcus Peters and Aqib Talib to form one of, if not the best, secondary in the league. In years past, defensive coordinator Wade Phillips has been heavily involved in evaluating defensive players for the coaches so selecting an edge rusher early could be highly likely as well to play next to the fierce interior duo of Aaron Donald and Ndamukong Suh. The Rams busy offseason has had their 2018 draft picks in constant flux. Out is their first-round pick (in exchange for Brandin Cooks), a fourth-round pick (Peters), a fifth-round pick (Talib) and a swap of sixth-round picks for Robert Quinn to go to Miami. In are a second-round pick for Sammy Watkins to head to Kansas City, a set of fourth-round picks (from Cooks & Quinn), and another fourth-rounder and a sixth-rounder for linebacker Alec Ogletree. All told, the Rams don’t make their first selection until Pick 87 of Round 3 this year and hold only one of their own original draft selections. Los Angeles has heavily factored in Senior Bowl week production into their recent draft classes, evidenced by their selection Cooper Kupp and Samson Ebukam – smaller school products from Eastern Washington a year ago. 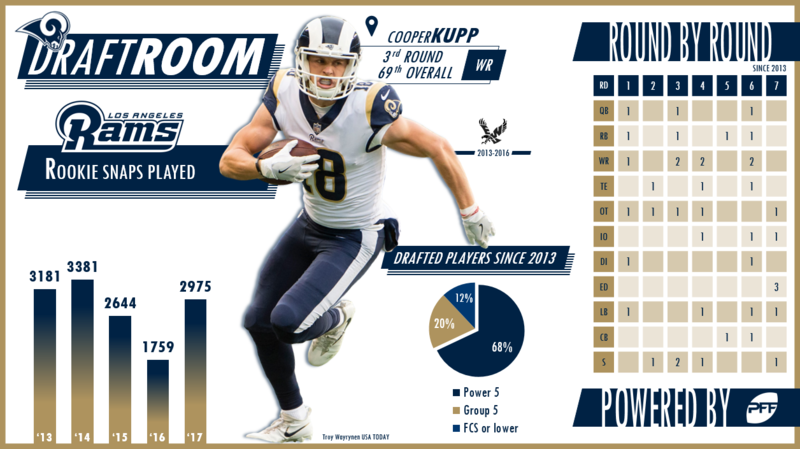 Using our Wins Above Replacement (WAR – roughly the number of wins a team gets from replacing an off-the-street player with the player of interest) metric as a model, Kupp was the second-most valuable rookie wide receiver from the 2017 NFL Draft and 12th-most valuable rookie at any position a season ago. RB Todd Gurley ranked second among all running backs in WAR, behind only rookie talent Alvin Kamara of the New Orleans Saints. On the defensive side of the ball, an emerging star at safety in John Johnson III finished as the league’s 10th-most valuable rookie at any position from the 2017 draft. How Have the Rams’ Draft Classes Stacked Up League Wide 2013-2017? Arguably the NFL’s best player, earning a PFF grade above 88.2 each seson of his career. Had a great rookie season, earning a PFF grade of 85.8 in the Rams secondary. A steal of last April’s draft, Kupp was one of seven qualifying receivers to average more than 2.0 yards per route run from the slot. His 2016 struggles were real, but Gurley’s emergence as a receiver in 2017 (90.5 PFF grade there) was a revelation for the Rams’ offense. His move from slot cornerback to safety was a boon for the Rams’ defense as it was for his PFF grade (from 78.4 to 90.3). Earned a PFF grade below 50.0 each of his seasons with the Rams. Just 11 stops and six total pressures in 319 snaps in 2017. Gave up an outrageous 13 total pressures as a pass-blocker at tight end in 2017. Started strong as a rookie, but faded a bit, catching just 53.1 percent of his targets, with three drops. Never lived up to his draft position or new contract, with a highwater mark of 509 receiving yards in 2016.